Solar energy is becoming increasingly common in the U.S. In 2016, the number of solar installations doubled over the year before. And over the next five years, U.S. solar capacity is expected to more than double. But solar energy still has a long way to go before it achieves mainstream status. Despite the fact that the U.S. has over 1.3 million solar installations – up from just 30,000 in 2006 – solar still provides just six percent of the energy Americans consume. And despite its larger population and higher rate of per-capita energy consumption, the U.S. has a lower installed solar capacity (18,317 megawatts) than economically comparable nations like Italy (which has installed 18,622 megawatts), Japan (which has installed 23,409 megawatts), and Germany (which has installed 38,250 megawatts). To expand the use of solar energy in the United States, policymakers and the public must continue to support aggressive solar energy goals. For instance, more states should adopt renewable energy targets. Unlike many other developed nations, the U.S. lacks a national renewable energy standard that would require electric utilities to provide a steadily increasing percentage of their energy from wind, hydroelectric, and other renewable energy sources. Instead, energy policies are set by individual states. Some states have extremely ambitious renewable energy targets, known as renewable energy portfolio standards (REPS). Massachusetts, for instance, has adopted a REPS that requires the state to source 50 percent of its electricity from renewables by 2030, and 100 percent by 2050. On the other end of the scale, however, over a dozen states have no REPS at all. While many states without renewable energy targets are investing in solar energy due to the cost benefits it offers over fossil fuels, implementing renewable energy targets in all 50 states would speed up the adoption of solar energy and further move the U.S. toward real energy sustainability. American solar energy goals should also include more legislation mandating solar panels on new buildings. Earlier this year, California became the first state in the U.S. to require solar panels on almost all new homes and multi-family residences. The mandate will increase the percentage of new Californian homes that include solar panels from 15 percent to nearly 100 percent when the rule goes into effect in 2020. Critics complain that the mandate will increase the cost of a new home in California by about $10,000. But over the 25-year lifespan of the solar panels, homeowners are expected to save $60,000 on their energy bills. Not only that, but solar panels add a premium to home values well in excess of their installation costs. A 2015 study from the U.S. Department of Energy’s Lawrence Berkeley National Laboratory found that “home buyers are consistently willing to pay PV home premiums across various states, housing and PV markets, and home types,” with average premiums equal to approximately $4 per installed watt, or $15,000 for an average 3.6-kilowatt system. In other words, California’s solar mandate is a smart move that could provide a model for other states looking to adopt similar legislation. American solar advocates should also direct their energy toward reducing or eliminating tariffs on solar panels and cells. Before the onset of the present trade war over aluminum, steel, and other products, the Trump administration imposed tariffs of up to 30 percent on solar panels and cells. The tariffs were introduced as a result of a Section 201 trade petition brought by two foreign-owned solar panel makers – SolarWorld and Suniva – with manufacturing bases in the U.S. Last year, the U.S. International Trade Commission agreed with the companies’ claim that foreign competition was crippling American solar panel manufacturers and recommended tariffs to the White House. Free trade advocates and environmental groups joined the solar industry in opposition to the tariffs. 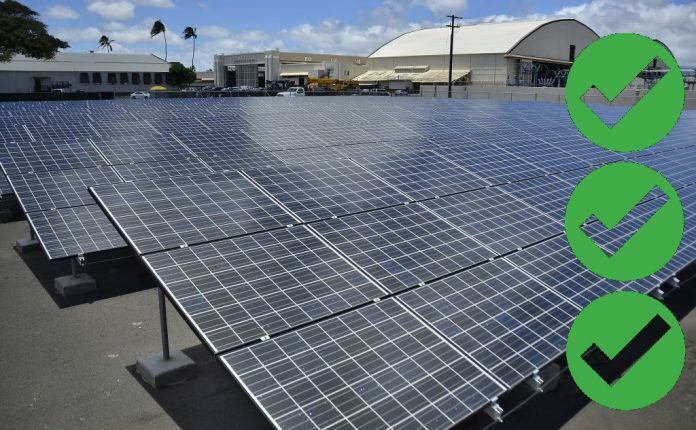 But despite their protests, the Trump administration approved tariffs of 30 percent on imported solar cells and panels in January. The tariffs decline each year by five percent before expiring in 2022. As a result of the tariffs, costs for major solar installations will rise by an average of 10 percent. While the industry as a whole is expected to continue growing, growth through 2022 will be about 11 percent lower than it otherwise would be. Reuters reported in June that the tariffs have already led renewable energy companies in the U.S. to cancel or freeze investments of over $2.5 billion in large installation projects. Rolling back these tariffs, therefore, should be a major goal for anyone interested in promoting solar energy in the U.S. In short, American solar energy goals should be oriented around maintaining pressure on legislators to adopt policies that encourage the growth of both rooftop and utility-scale solar installations, and to reduce barriers that limit the overall expansion of the solar industry.